I’ve spent some time investigating billing solutions for a premium subscription feature we are considering for YLF. This area is a minefield. Until recently, it has been a lot of work to get an online business set up with recurring billing. Over the last year or so several startups identified this pain and set out to offer easy solutions. So today there are several ways that on the face of it seem to be simple. Unfortunately, the minefield is still there. In this post I’m going to summarize what I learned about four of the services that promise to take the pain and complexity out of online billing for startups. They are Braintree, Chargify, Recurly and SaaSy. Note that I haven’t implemented any of these solutions. When I first started thinking about recurring billing my focus was on finding a solution that would minimize the amount of custom code that I would have to write. Like most startups, I’d like to spend more time on product and user experience, and less time on infrastructure. This is the area where my four options all excel. Obviously there are differences that will impact the user experience (more on that below), but all of them eliminate a lot of the pain associated with building the system yourself. The second kind of setup pain, which I will call payment processing setup, is the one you don’t expect. It is the insanely complex world of payment gateways and merchant accounts. I won’t go into details, but suffice it to say that (1) the payment processing world is still catching up with Web 2.0 and (2) the risk associated with processing credit card transactions has added layers of complexity. In the past the best thing to do would be to find someone you trust who has waded through this mess before and get them to help you. If you don’t have a friend like this, Sachin Agarwal’s great outline of the payments space is an excellent place to start. Happily, Braintree and SaaSy eliminate the need to set up your own payment gateway and merchant account. Chargify and Recurly don’t address this directly, and although they do promise to help you get started, this means that they aren’t really offering a complete payments solution. At least not in the way I would define it. All of the engineering is done, but some of the business/logistical complexity is left to you. One thing worth mentioning is that merchant accounts are particularly tricky, but companies like FeeFighters have identified this and created services that make it easy to compare merchant account offerings. This might be the most critical aspect of your payments system: the ability to leave the provider and take your customers’ credit card data with you. It is frighteningly easy to get yourself into the situation where a provider won’t, or can’t, release it to you. This not only impacts your ability to change providers, but can hurt you in other situations too. Just read the nightmare scenario described by Isaac Hall, founder of Recurly, where a company he worked for previously lost all their customer data. Also see CEO of Braintree, Bryan Johnson’s open letter to PayPal and Authorize.net on this issue. While Recurly and Braintree have their own “vault” for customer data and promise full credit card portability, Chargify and Saasy do not. If you use Chargify, you need to set up your payment gateway to store the customer data (e.g. Authorize.net’s Customer Information Manager option), so they don’t have control of the data and couldn’t release it to you even if they wanted to. Ken White of SaaSy told me that the credit card data portability standard is something they don’t support yet, but will consider in future. Personally, I’m torn on this issue. On the one hand my intuition tells me that the portability is critical, and this is reinforced by the horror stories told by those who support it. On the other hand, many, probably most, successful businesses are operating without it. Here’s another area where complexity quickly gets the better of you. All of the services have different price structures, so this isn’t just a case of building a simple spreadsheet. In fact, I wrote a script to do the calculations and I’ll get to that in a moment. First, cost transparency and predictability. Braintree and SaaSy are the most transparent, predictable options, but for different reasons. SaaSy is without doubt the simplest recurring billing payments solution the world has ever seen. You have two options: (1) 5.9% plus 95c per transaction, or 8.9% per transaction. That’s it. You don’t even pay additional fees for chargebacks (when someone disputes the charge on their credit card). Braintree is transparent and predictable, but they expose you to more of the complexity inherent in the system. There is also a little more risk in their pricing because there is an added cost for chargebacks. Chargify and Recurly are much more difficult to parse from a cost perspective, simply because they are only one component of the cost. You pay separately for your payment gateway and merchant account. This means that calculating your overall costs becomes a matter of getting quotes from three different places and building this into your model. I must say, their pricing is really quite misleading when you are new to the payments space. Of course, you understand the realities of the additional costs of the gateway and merchant account soon enough, but I wish they were more upfront about it on their pricing pages. No doubt there will be many people who have had great success using Recurly or Chargify and no problem at all getting set up with payment gateways and merchant accounts that have reasonable fees. But here’s the thing: You can go to the Saasy or Braintree pricing pages and immediately know what the costs will be. For Chargify and Recurly, it will be their fees, plus something else. And for that something else, your mileage may vary. Ok, the bottom line. I’ve looked at many permutations of this using my cost calculation script. Here are my takeaways. First, you pay for easy, low risk and predictable. In most situations SaaSy is significantly more expensive than the other options. SaaSy’s model can make it lower cost for the first few subscribers. This is especially apparent for low subscription costs, where SaaSy is profitable immediately, whereas the other options all have fixed costs. For most purposes this is not material though — if you don’t have the subscription fee or the number of subscribers to quickly get past the break even point then you have bigger problems. Psychologically though, there is something very appealing about SaaSy’s $0 price of entry. For larger subscription fees, you pay dearly for the simplicity of SaaSy. For a $50 sub, for example, the other three options tend towards 3.5% fee per transaction overall, whereas SaaSy is pegged at 8%+ for both pricing options. Despite offering a lot more value than Chargify and Recurly, Braintree is competitive with a around 0.5% premium in most situations. You mileage may vary, but for a solution that shields me from the payment gateway and merchant account complexity, this is cheap at the price. Also, it is quite possible that unexpected costs in the payment gateway and merchant account will eat up that difference and more if you use Chargify or Recurly. One other thing. Chargify and Recurly only quote pricing up to 10,000 transactions. In our monthly subscription situation that translates to 10,000 subscribers. Many startups probably have ambitions north of 10,000 users, but I think it is safe to assume that their pricing will get better beyond 10,000. Braintree and SaaSy are also likely to be open to negotiating the pricing structure once you get beyond 10,000. But don’t take my word for it — play with the numbers yourself. Here I’m on shaky ground because I haven’t (yet) created a billing experience based on any of these solutions, but the main impact I see is the extent to which you can integrate the sign up experience into your site, securely. The “securely” part is very important. It means that I want to minimize PCI compliance hassles and have therefore decided that the credit card number should never be stored in our environment. Braintree is the best of all worlds in this respect. The signup form is on your site and totally within your control (no iframes), but their transparent redirect means the credit card number never touches your server. SaaSy will host a sign up page, so it isn’t on your site. but they do allow you to style this page with your own CSS. Chargify and Recurly will host your sign-up page and they have templates that can be customized. Just as secure as Braintree or Saasy, but with less control over the user experience. Note that you do have the option to use their APIs to completely control the experience, but then you will be storing the credit card data on your server at some point. All of these solutions do a great job of eliminating pain. Recurly and Chargify focus on the aspect of building the system and make that orders of magnitude easier than it would be to do so yourself. Braintree takes it a step further, and at relatively low cost, also removes the complexity and risk associated with payment gateways and merchant accounts. 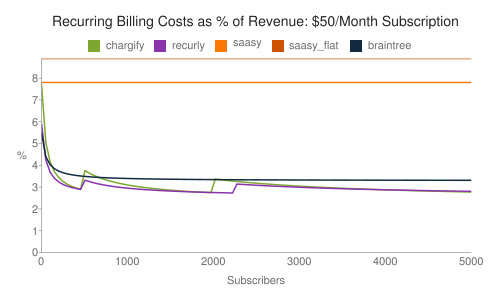 SaaSy goes all the way, making it easier than it has ever been to set up recurring billing. Braintree and SaaSy also give me more control over the user experience, which is important. SaaSy is new though, whereas Braintree is a tried and testing solution that is used by many well known services (e.g. OpenTable, GitHub, EngineYard, 37signals). And unless your monthly subscription fee is low, SaaSy is very expensive. Braintree has one thing that is really compelling: complete customer portability. Ultimately this might be the deciding factor. If you know more than me about recurring billing (likely! ), then please weigh in and make corrections or additions. If you are a provider (one of the ones I mention, or another one) feel free to jump in too. I’m particularly interested in the issues around customer data portability. I feel like I’m missing some important pieces of that argument. I expect to make changes to this post as my understanding of the space evolves. Update 10/2/2011: Stripe, a new online payments service, launched recently and I wrote a new post to add them to the comparison. It is a significant update. Assuming they are true to their word on features and data portability, they win on all counts in a comparison table like the one above. Update: Thanks to @ctide for pointing out one serious bug in my first version of the script that calculated the costs for Saasy. I neglected their $0.75 fee minimum per order. This led me to believe that Saasy was very competitive for smaller subscriptions, but they aren’t. I have corrected the script and updated the text to reflect this. Posted: March 18th, 2011 under The Wild Web. Wow – thank you very much for posting this and providing the script. Extremely helpful. Saasy seems great to me with one exception – the fact that users have to go off your domain to purchase a subscription. I imagine this would confuse a lot of people and lead to high drop-off rates. Paradoxically, any increased security that results from this would actually lead users to believe less in your security. Am I alone in thinking the inability to integrate the payments page into one’s domain is a complete deal breaker? explaining how it is that while it may appear that all-in-one SaaSy costs more than the basic recurring billing services, it actually both saves and earns companies far more than those alternatives. If you’re just comparing the prices against other services’ prices, you’re missing the story here. Also, the basic services that require you to try to obtain your own merchant account lead to you paying all their various fees *plus* 3.5-4% in processing fees you’ll have to pay yourself. or managing every aspect of the e-commerce infrastructure themselves. But for everyone else, including those who would prefer spending their time and resources on growing their companies, there’s now SaaSy. Re: user experience, you’ll find ample flexibility built into the order page configuration options. Thanks again for doing the research to help others with their decision. Dan, I’ll repeat my TechCrunch comment here too. In my calculations I *do* include all costs, not just the prices of the services themselves. So it is apples to apples. I think the one exception is the chargeback fee. I posted the script, so feel free to comb it for errors. Gabe, I think that’s a dealbreaker for me too. This is where Braintree’s transparent redirect is very good. I would recommend trying CheddarGetter. CheddarGetter specializes in recurring billing, and its features are built around simplifying the whole process, including multiple pricing plan options, a custom payment gateway, PayPal integration (if you want it), robust analytics, and a thoroughly documented API. They’re also just about to roll out a few tools especially made for start-ups, such as a Quick Start Wizard and Hosted Payment Pages that take away most of the hassle of setting up your billing with PCI compliance and an external merchant account. And finally, CheddarGetter creates an easy user experience for your customers, and it’s one of the cheapest options out there. Brilliant article – thanks for taking the time to do this. The calculator is really useful. This is hands-down the best article I’ve read on the matter of the recurring billing options available today, and your calculator is brilliant! Thank you very much. Brilliant article, I’ve been searching for a while now and it seems ludicrous to me that industry as a whole hasn’t caught up with recurring billing trend and simplified the process — still clear as mud in many aspects. SaaSy does look great to begin with, but I would be a little wary of being tied into a merchant account / gateway that I haven’t chosen myself. The portability is a great point too. We’re in the middle of doing just this set of comparisons. I also read your more recent post including Stripe. Thanks! This was HUGELY helpful. 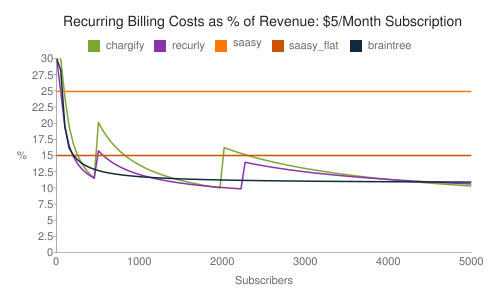 I do have one question for you…If SaasY’s costs are simple…just 8.9% and nothing else…how can the lowest cost SaasY option in the chart run 15% of revenue? I’m clearly missing something. Help me out please! And now, of course, I’m off to check out Stripe. Many thanks! Deb, the complexity I failed to mention (but updated later thanks to @ctide) was that SaaSy has a 75c minimum fee per order. This happens to be 15% of the $5 subscription in the first chart. Thanks for this summary. I was curious why you didn’t consider Zuora and Aria Systems in this review? Is there some reason they didn’t fit into the comparison? I’m looking at picking a solution for our startup and like most people, I find the options and permutations a bit daunting. Thanks for helping to clarify it a bit. Chip, the reason I didn’t include them is that I didn’t know about them at the time. If and when I can free up some time I will update the comparison and calculator to include some of the options I missed. This space is sure getting crowded. Have been trying to get my head around all these options for a few days until I found this excellent article. I have one question, which is simply this – is there a good reason not to just use PayPal’s business accounts and subscription feature? Am I missing something? Regarding PayPal: I ruled them out from the start because I didn’t want users to leave our experience to set up the recurring payment. I wanted it to feel integrated. I probably should have made this decision explicit. I setup Merchant Accounts, Payment Gateways, etc…and I have been trying to get a handle on these 3rd party subscription billing services. What I am trying to figure out is that other than the card holder data portability concerns, what are the recurring payment modules contained within the payment gateways themselves not providing? It doesn’t go into the details of each provider, but it’s a good list of companies that operate in this space. This is brilliant thanks Greg, the calculator is awesome too!! Checking out PayPal now too, would be great to see this in the calculator although I know it takes the user off the site….just wonder if folks don’t mind ( ditch the signup: ) given PayPal’s a household name? Aria and Zuora don’t even list their pricing/plans on their sites. Since there was an emphasis on transparent pricing in this article, their exclusion here is warranted (even if unintentional).